The 2018/19 winners of the prestigious Ngārimu VC and 28th (Māori) Battalion Memorial Scholarships were announced in a celebration at Parliament on 8 April 2019. Awarded annually in honour of the 28th (Māori) Battalion, the scholarships exemplify excellence in education as well as service and commitment to the community. Kahurangi Waititi is currently completing her PHD in Māori Media and Communications at Waikato University. Kahurangi says as a daughter of a Major in C Company she has grown up around stories of the 28th (Māori) Battalion – the sacrifices they made, the lifelong relationships formed and the hononga whakapapa that gave the Battalion its unique character and fighting edge. “There is huge significance for me in receiving a scholarship that is an entrenched part of my whakapapa,” says Kahurangi. She says a Ngārimu scholarship provides her with an opportunity to focus on her research for the next two years. Kahurangi’s thesis explores mana motuhake through moving image and follows the creative retelling and passing down of a Te Whānau ā Apanui kōrero tuku iho through time and space. Te Waikapoata Tamati is studying at Otago University where she is currently studying towards a Bachelor of Dental Surgery. Te Waikapoata had koros who fought in both wars. Koro Henare was in the New Zealand Pioneer Battalion, and Koro Tomai who was in the 28th (Māori) Battalion. She says she is proud of the legacy her koros left her. "These men and their deeds are legendary and I’m proud to be a part of it," she says. Te Waikapoata is passionate about dentistry and wants to make a difference in the negative oral statistics and achieving better health outcomes for whānau. "This scholarship will definitely help me towards achieving that goal." She says the cost of studying can be prohibitive and has welcomed the support of a Ngārimu scholarship. "I am honoured to be named as a Ngārimu recipient and feel humbled to be included in such a prestigious group of individuals." 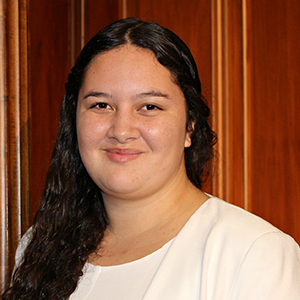 Tekiteora Rolleston-Gabel is currently at Waikato University where she is studying towards a Bachelor of Science with Honours in Molecular and Cellular Biology. Tekiteora says the scholarship will be of great support to her research in science. She says she is honoured to receive a scholarship and acknowledges Victoria Cross winner Second Lieutenant Te Moana-nui-a-Kiwa Ngārimu and the members of the 28th (Māori) Battalion. "It’s also important to acknowledge the Ngārimu board who through these scholarships support the pursuit of education," she says. "I am immensely grateful for the way kaupapa Māori education has enriched my learning and understanding of pūtaiao. As such, I would like to acknowledge Te Kura Kaupapa o Taumārere, Te Kura Kaupapa Māori o Kaikohe, Te Kura Kaupapa Māori o Whakawātea and Ngā Taiātea Wharekura." Tamahou Thoms is currently studying towards a Bachelor of Arts, majoring in Māori and Indigenous Studies, and a Bachelor of Law at Te Whare Wānanga o Waitaha (Canterbury University). Like his fellow recipients. Tamahou says he is humbled to be a Ngārimu scholar. He says the scholarship will alleviate some of the stresses of student life and allow him to focus on his studies. "I am most grateful," he says. “It is through the efforts of those who have passed on that I am lucky to receive this." "The stories of all Māori who went to the wars have always been of interest to me." "The heroism that is still talked about makes me proud to have grown up Māori," says Tamahou. Brandon Manuel is currently studying at Canterbury University towards a Masters of Education. Brandon is passionate about education. He sees it as a doorway to a number of pathways and wants to fan that enthusiasm for learning to the next generation. "I’m dedicating this scholarship to the many selfless teachers who have helped me during my journey," says Brandon. He says the scholarship will allow him to focus on his studies. "Our ancestors of the 28th (Māori) Battalion sacrificed their lives and time away from their whānau in the hope of better future for us all. I intend to honour their legacies by positively influencing and impacting as many people as possible," he says.